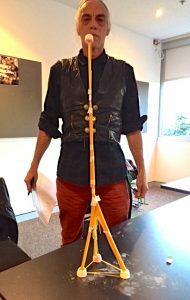 I was recently invited to participate in and critique a new course AFTRS is presenting on Innovation and Human Centered Design, during which I was introduced to the team building exercise the Marshmallow Challenge concept. The challenge provides each team with five marshmallows, a packet of spaghetti and some tape, and the challenge to build the highest free standing tower in the fastest time under 20 minutes. Building a tower to 30 cms is considered a high height. After the exercise was completed I was to learn that the challenge has been around for a while (at least 2010) and it’s delivered some very interesting insights. Generally speaking kindergarten children do best at the task, CEO’s are not too bad but much better when assisted by their EA’s and business degree students are the poorer performers. In our exercise we were given 12 minutes to complete the task and I’m very pleased to share that my team won the challenge in the class, building our freestanding tower to 40 cms in nine minutes! Yay team!